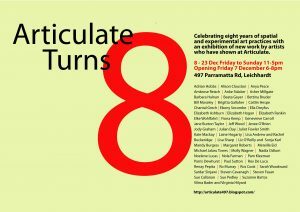 It All Adds Up is a work in progress that will be exhibited at Articulate Turns Eight Exhibition. 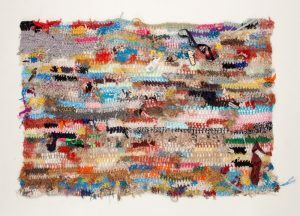 This work is made from discarded bits of string, ribbon, rope, twine and shoelaces collected from alleys, streets, parks as well as from household stashes of similar material. If you would like to contribute to It All Adds Up there will be an area near artwork to leave your donation. Along with contributions, stories related to donations are welcome. This project is well over halfway and continued contributions needed.